Description: Prostrate to ascending annual herb with several stems to c. 30 cm long, often forming dense mats, ± villous. Leaves oblong, elliptic or obovate-oblong, mostly 3–8 mm long, usually 1–4 mm wide, finely toothed to ± entire, often with a reddish brown spot in the middle; stipules subulate, ± lacerate, to 1.5 mm long. Cyathia with narrow white to pink, lobed appendages to 0.5 mm wide. Capsule c. 1.3 mm long, 1–2 mm diam., appressed hairs scattered over the 3 faces, angles more rounded; seeds pale brown, often with a whitish bloom, 4-angled. Distribution and occurrence: Garden weed, often grows in cracks and paths. Native of N Amer. Other Australian states: *Qld *Vic. *N.T. *S.A. *W.A. 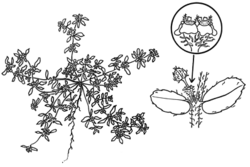 The names Euphorbia thymifolia L. and Chamaesyce thymifolia (L.) Millsp. have been misapplied to Euphorbia maculata L.